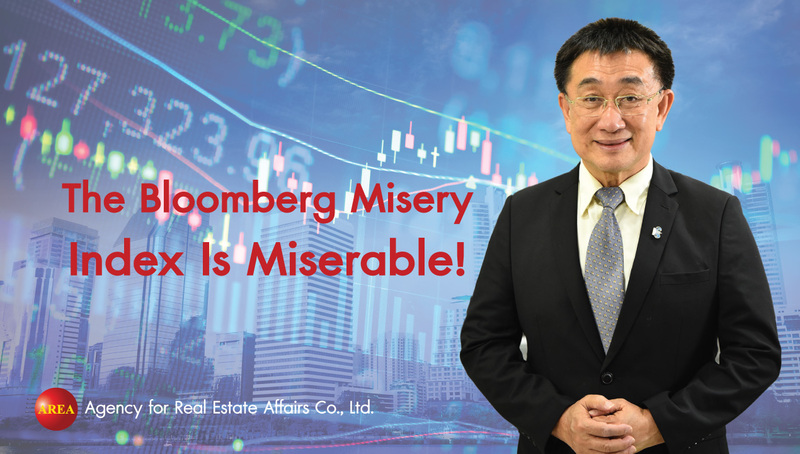 The Bloomberg Misery Index Is Miserable! Recently, Bloomberg released its findings that Thailand was the least miserable' country on Earth. Is this real? As A Thai, I hope so but it could not be! According to the news, Thailand has been ranked as the least miserable country out of 66 economies for a fourth consecutive year, according to Bloomberg's Misery Index for 2018. Thailand again claimed "least miserable" status though the nation's unique way of calculating unemployment helps give it the edge over the next least miserable, Singapore. The island state claimed least miserable status in 2014" (http://bit.ly/2HlAkst). This is a good news for Thailand. However, this results are very doubtful. Dr.Sopon Pornchokchai, President, Agency for Real Estate Affairs (www.area.co.th) which is the largest real estate information and valuation centre in Thailand was surprised about these findings. It is a good hope that one day Thailand would be one of the best place to stay with least miserable status. However, this might be a misunderstanding for the time being. Since the value of the Adjusted R Square is afar below one. This implies that there is no significant relation between the dependent variable and the six independent variables. In other words, the Bloomberg Misery Index is too doubtful. There might be something wrong in the construction of this index or there might be some distortion for the benefit of the current government of Thailand somehow or some other unidentified reasons. Thus, the Bloomberg Misery Index Is Miserable!